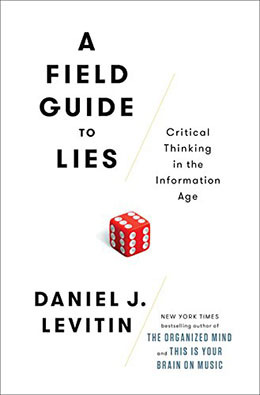 The cover of his new book declares Daniel J. Levitin the “New York Times Bestselling Author of The Organized Mind and This is Your Brain on Music.” That’s impressive, but also ironic given it’s the kind of fuzzy statement that Levitin, a psychology and behavioural neuroscience professor at McGill, urges us within its pages always to query. Were one or both of these titles bestselling, or was Levitin a bestselling author before he wrote them? Does “bestselling” imply a certain number of copies sold, weeks on the list, or is it relative: can you be bestselling even if book sales, overall, are low? The eye-catching title, A Field Guide to Lies, is a tad hyperbolic as well. Though much of Levitin’s focus is on how statistics and language can mislead us, he readily admits the reasons behind this aren’t always nefarious. What data “means” often gets mangled by those untrained in its interpretation or lexicon, like reporters. Inadvertent error can also enter the statistical process during data collection or experiment design. Lies and misinformation have always been with us. The difference today is one of scale, the last five years having produced “more human-made information than in all of history before them.” With myth-debunking websites like snopes.com no longer able to keep up, Levitin wants to arm readers with critical-thinking tools for tackling the ever-thickening morass of mendaciousness. Still, when confronting dubious claims our first line of defense remains common sense. If C-Span tells advertisers it’s available in 100 million homes, that doesn’t mean 100 million people are watching the channel (and in C-Span’s case, you can be pretty sure this isn’t the reality). Much like Nate Silver’s (New York Times bestselling!) The Signal and the Noise, Levitin’s is that rare book that makes statistics both understandable, at times even intriguing. His strongest chapter, about graphical chicanery, gives useful examples of how statistics can be made to say almost anything via the manipulation of axes or timelines that play to our visual bias. That A Field Guide to Lies should be published during the run-up to an American election in which lying has taken centre stage to an unprecedented degree thanks to GOP-nominee Donald Trump — who’s seemingly accused of it every time his lips move — might be a case of impeccable timing. Though Trump is mentioned only in passing, Levitin sheds sideways light on his improbable success by citing one of humanity’s behavioural foibles: it seems we’re hard-wired to keep believing something we’ve been told is true even in the face of overwhelming evidence to the contrary.